Air Force Capt. 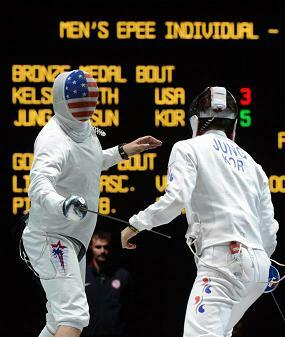 Seth Kelsey plans to return to the Olympics in 2016 after finishing fourth in fencing at London. He was edged out of winning the bronze medal in overtime in the men’s individual epee event. Still, he is satisfied with his performance in London. Kelsey has been fencing for 20 years, ever since his friends first invited him to try out the sport. When he’s in a match, Kelsey makes sure to keep his mind in the moment. “I tend to focus on the preparation that you are doing: how you want you to be controlling your footwork, imposing your game on your opponent and trying to eliminate any thoughts that are outside that,” he said. Kelsey is a reservist with the 310th Force Support Squadron based out of Buckley Air Force Base, Colo. – the same unit as Staff Sgt. Jesse Childress, 29, who was one those killed in the July theater shooting in Aurora, Colo.